Photo contest: Win an iPod Shuffle! Bear Creek Lumber has in inventory or is also able to quickly source timbers either for your timberframe, post and beam, pergola, trellis or deck project. The most common species utilized in timber structures are Douglas fir, western red cedar and Port Orford cedar, with fir being the yardstick to which all other species measure up to. 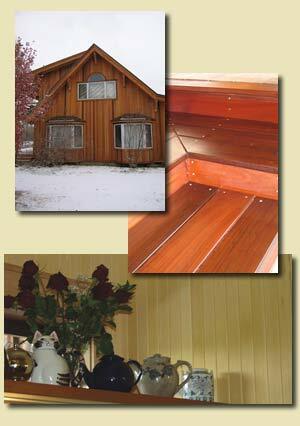 Douglas fir has been used for hundreds of years in structural applications and is among one of the strongest woods. When strength is a critical factor, remember that the higher the grade, the higher the strength will be. If you are thinking of pricing two different species for the same project, we recommend that you review the design specifications with your structural engineer or architect, since the size of the timbers may need to be adjusted if you are switching species. We have currently several units of Port Orford Cedar in inventory in a clear, uniform grade that can be used both in structural and appearance applications. This material is very rare and it won't last long, so place your orders while it lasts! Western red cedar timbers are the preferred choice for garden applications such as pergolas, gazebos, trellises and decks- for its stability and natural resistance to decay. Hemlock is currently on inventory in 3"x7" and 4"x4" C and better grade.When ordering lengths over 20 feet, please take into consideration that lead times will be 30 to 60 days, as with any custom order at Bear Creek. Also take into consideration that kiln drying your timbers adds extra handling time, even when choosing the faster RF (microwave) process. Given the fact that Bear Creek sells timbers in the higher end of the grading scale, you should expect minimal end-checking and twisting on fir. We offer these products in many different dressings, such as rough cut, resawn, hand-hewn and surfaced on four sides. Give our friendly sales staff a call at 800-597-7191. They will help you select the right species and product for the application and budget that you are aiming for. Our number one goal is your satisfaction- that's why we work hard to deliver high quality wood products that will make your projects stand out in the crow. One of the best-kept secret destinations of the Northwest, this valley has been home to Bear Creek for all it's 30 years in business. The Methow Valley offers visitors a range of activities to choose from, including hiking, hunting, fishing, climbing, nordic and downhill skiing, and horseback riding. When venturing into such wild scenery, a comfortable basecamp is a must. These great lodges we are featuring can provide you with much needed relaxation and gourmet meals after a day out in the woods. The contractors and architects that built these lodges came to Bear Creek Lumber looking for high quality wood products that reflect a rustic, upscale look. We are proud to share with you these pictures containing our products in some of the most beautiful lodges in this valley. Come visit us soon! A family run, cozy inn that is at the heart of the trail system, literally steps away from it - from the trail to the hut tub in less than five seconds! The lodge has western red cedar 1x8 channel siding, and the porches are decked with red cedar and have pine soffits. Red cedar shingles were used as accents on the eaves. Extensive use of Douglas fir logs inside the lodge, and a combination of beveled red cedar and shingle siding make this lodge look as if it's been there for 100 years. The porches all have 2x6 knotty cedar decking and 2x8 tongue and groove soffits. The generous spaces in this lodge allow for extensive use of wood panelings on the interiors, as shown in these interior shots of the dining area. All the ceiling paneling is red cedar and the interior trim is Alaskan Yellow Cedar. The builder for this project was Schuchart Construction of Seattle. Situated above the valley floor with territorial views of Mount Gardner and the entire valley, this lodge has used our products in several of their building stages, including an addition that is currently underway. This lodge is one of the hubs for Nordic skiing, with a full rental shop and a ski school. These pictures are a great example of exposed western red cedar shakes -and how they will weather-, and Douglas Fir peeled logs. The interiors are paneled with 1x4 knotty red cedar tongue-and-groove flush joint. Spring Photo Contest. Win an iPod Shuffle! As part of celebrating our 30 years in business, we are accepting entries that are emailed photos or prints. The entry requires a minimum of five pictures of your jobsite or home depicting some of the most common products we sell, such as paneling, trim, timbers, decking and siding. Also needed are descriptions of what the lumber used was (species, grade, and description). Finished pictures are optimal, but under-contruction shots will be accepted. What we are looking for is nice wood and a beautiful project. Show us your best pictures of how you used our products. These pictures will be used in our advertising and/or promotional literature. Please make sure you fill out our photo release form available online. (You will not be eligible to win unless this form is filled out.) Our panel of industry experts will choose the most unique and or beautiful entries. The winner will receive an iPod shuffle, and second and third place contestants will receive Bear Creek Lumber merchandise. Shown on this page are some examples of winning photos. This contest will be open to entries from March 1st to April 14th, 2007. Winners will be notified by May 1st, 2007 and entries will appear in our May issue of Timberline.